Squished Frog Blog: KALI is OUT! Here's some big news... My new book is out. 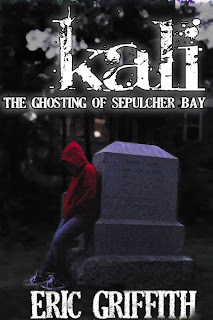 It's called Kali: The Ghosting of Sepulcher Bay , my first foray into the world of YA (that "young adult" in case you missed the crappy movie with Charlize Theron). It's the tale of a 15-year-old girl named Kaliope "Kali" Stergakos who has a severe ghost problem. In that they happen to possess her body when she sleeps. And that's not even the worst thing she's got to deal with. This book is exclusively available at Amazon for the Kindle. At some point I'll go into why I decided to essentially become my own publisher with this book (part of the reason: I love this book, and I think other people will too). And why I went with Kindle Direct Publishing as the platform to start with. Eventually, I will likely expand the book to other ebook platforms, but that's a few months away. So, please, if you own a Kindle ebook reader, or any devices that supports the Kindle reader software – an iPhone, iPad, Android phone, even a full-fledged computer running Mac or Windows, they all have Kindle software available—I hope you'll give KALI a try. At only $2.99 I think it's priced right and if you like some rollicking good teen adventure with some ghostly chills, it should be just your ticket. Guest Blog Post Means You Could Win a Free BOOK!